After a quiet summer last year, Real Madrid will surely be looking to make amends when the transfer window re-opens at the end of this season. 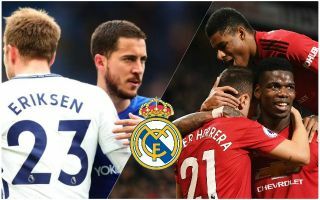 The Spanish giants are yet to truly replace Cristiano Ronaldo after his move to Juventus, and talk is intensifying that Chelsea forward Eden Hazard will be one man coming in to strengthen the club’s attack. The Daily Mirror is among the sources stating Madrid are confident of signing Hazard for around £100million, following months of speculation surrounding the Belgium international as he approaches the final year of his contract at Stamford Bridge. One of the best players in the Premier League ever since he joined, Hazard seems ideal for Real’s needs and should have little trouble making the step up for one of Europe’s historically biggest club sides. He probably won’t be the only attacking midfield player coming in, however, with in-the-know Spanish football expert Guillem Balague telling BBC Radio 5 Live (quoted here by the Daily Star) that a huge amount of money is being set aside for Neymar, or for a combination of Hazard and Tottenham playmaker Christian Eriksen as an alternative. Given the Spurs star is another elite Premier League player whose contract will be up at the end of next season, it makes perfect sense that he’s being eyed up by Real. The club will need a long-term Luka Modric replacement, and Eriksen fits the bill almost perfectly after establishing himself as one of Europe’s best creative players in his time at Tottenham. The Denmark international could also potentially help cover for Gareth Bale, whom Don Balon suggest is edging closer to a move back to the Premier League after buying a house in London, which makes sense as things really haven’t worked out for him at the Bernabeu. Christian Eriksen to Real Madrid transfer on the cards this summer? Finally, in a potential triple raid on the English top flight, the European champions have also been linked as keeping an eye on Marcus Rashford’s situation at Manchester United, according to the Telegraph. That report explains that the Red Devils are trying to tie the 21-year-old down to a new contract, and while his situation is not as desperate as that of Hazard or Eriksen, he could become an increasingly realistic target if things aren’t sorted by the summer. The England international has been superb for United this season, showing some of the finest form of his career since being moved up front on a more regular basis by Ole Gunnar Solskjaer. It’s easy to imagine that, were Real to succeed in this raid on Man Utd, Rashford could be an ideal long-term replacement for Karim Benzema at centre-forward. Away from raiding the PL, Diario Gol have also linked Los Blancos as among the clubs in for the signing of Ajax wonderkid Matthijs de Ligt, who could be an immense signing in defence. Raphael Varane isn’t having the best season, while Sergio Ramos cannot go on forever, so this top class 19-year-old would complete a perfect summer spending spree for the club if they could do it.